Be the first to share your favorite memory, photo or story of Kristie. This memorial page is dedicated for family, friends and future generations to celebrate the life of their loved one. 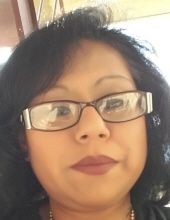 Kristi Lazoya of Amarillo, Texas passed away Thursday, November 15th, at the age of 34. Kristie was born on September 30, 1984 to John and Christina Lozoya in Plainview, Texas; the family has lived in Hereford since 1962. Ms. Lozoya met her husband Gabriel Rodriguez in 2005 and the two made their home in Amarillo, Texas. She was a homemaker and a loving wife, sister, and aunt to her family. She enjoyed knitting, crochet, and puzzles and especially spending time with her niece and nephews. People knew her for her kind and generous heart. Ms. Lozoya is preceded in death by her mother Christina Lozoya. She leaves behind her husband Gabriel, her father John Lozoya of Hereford, Texas, her brother Joshua and wife Maria and of Amarillo, Texas, sister Ruth and husband David Knapp of Amarillo, Texas brothers John Lozoya II of Hereford, Texas, and Manuel Lozoya, of Amarillo, Texas. Her nephews and niece, Joshua and Sophia Lozoya, and David Knapp, all of Amarillo, Texas as well as cousins and friends also survive her. Fr. Molina will be the Celebrant. "Email Address" would like to share the life celebration of Kristie Eileen Lozoya. Click on the "link" to go to share a favorite memory or leave a condolence message for the family.